One of the most comprehensive and complete Wine Tours of Sicily, including unique food experiences to taste the typical delicacies and the particular flavors of the region. With its variety of landscapes and its unique character Sicily has so much to offer! 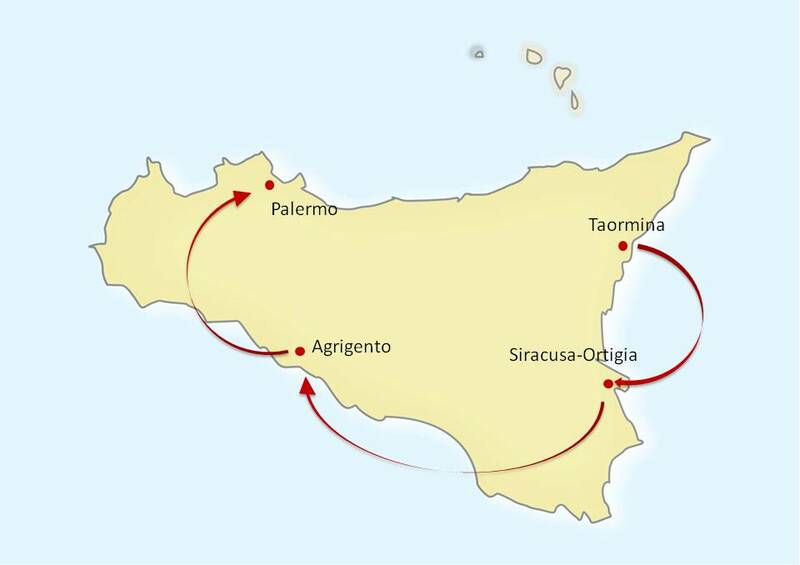 Complete Tour of Sicily featuring Taormina, Etna Vulcano, Siracusa, Noto, Ragusa-Ibla, Modica, Agrigento, Caltagirone, Piazza Armerina, Marsala, Erice and Palermo. Live the splendor of Sicily. Discover the iconic places of amazing, almost unique beauty, magnificent views, miles of curving coastline and picturesque mountain sceneries. Don’t miss the art beauties of this incredible land with its UNESCO World Heritage sites. Travel between Trapani and Marsala on the Salt Way Road. Get your apron and cook your Lunch in one of the best Wine Estate of the Island. Taste the “wine” ice cream in Ragusa-Ibla and the special chocolate of Modica. Experience old Sicilian tradition, learn the secrets of the unique production of the Sicilian wines and appreciate their quality and exclusive flavors. Enjoy wonderful views over the valleys and vineyards, between the marvelous blue of the sea and the sky. 11 Nights accommodation in exclusive and fascinating 4 stars Hotels or Historical mansions, with full buffet breakfasts: 3 Nights in Taormina, 2 Nights in Siracusa, 3 Nights in Agrigento and 3 Nights in Palermo. Private sightseeing walking Tours with expert local English speaking Guides, including the entrance fees to the sites visited: Taormina (Greek-Roman Theatre included) – Siracusa (Greek Archeological Park) – Noto – Piazza Armerina (Villa del Casale) – Agrigento (Valley of the Temples) – Erice – Monreale (Cathedral) – Palermo (Hidden Palermo and city highlights – Palatine Chapel). Etna winery visit and tastings and Lunch in Typical Local Restaurant. Winery visit, wine tastings of “Santa Cecilia DOC Noto” and “Passito” di Noto DOC wines and light Lunch. Winery visit, wine tasting and light Lunch in Marsala. Visit of a famous and gorgeous Estate between Palermo and Caltanissetta with 5 wines tasting and Lunch at the Estate, with wines pairing. Sicilian Cooking experience (recipe book and apron included) in one of the best Italian winery near Ragusa, with visit, Lunch and wines tasting rediscovering “Nero d’Avola” in its native territory. Olive oil tasting and Typical Sicilian Dinner with local fresh products and wines at your Estate in Agrigento. Private transfers with deluxe van with English speaking driver from the airport to the hotel. 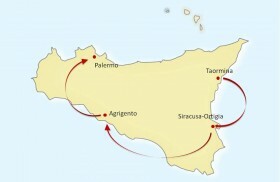 Tour begins in Catania and ends in Palermo (it can be operated also starting in Palermo and ending in Catania). Guided Tour of Taormina: enjoy its amazing, almost unique beauty, combining sea and sky and its Greek-Roman Theatre, one of the most striking monuments of the antiquity. Full Day Ride on the Etna Volcano and visit of a boutique Etna winery, where the winemaker will be glad to explain the unique characteristics of the vineyards of this area. Delicious Lunch in Randazzo with local food paired with local wines. Entrance and Guide for the Archeological Park of Siracusa. Visit Noto, called “Stone Garden” because of the incredible decorations on the buildings of the city, listed indeed among the UNESCO World Heritage Sites as one the most precious example of Baroque art in Europe. Get captured by the beauty of one of the most breathtking wine Estate of Sicily that currently covers 51 hectares, where you will have Lunch and wines tastings. Visit Ragusa-Ibla, the oldest part of the city rich of churches and Baroque buildings; stroll amongst a maze of narrow streets and steps which join the upper and the lower parts of Modica, a charming destination because of its splendid Cathedral and famous for its production of chocolate, similar to that used by the Aztecs at the time of the discovery of the New World. Cooking experience in one of the best Italian Estate and enjoy a delicious Lunch with your own prepared meal accompanied with local wines in the picturesque dining room with a wonderful view over the valleys and the vineyards,. Stop in Caltagirone, renowned for its ceramics workshops. Reach Piazza Armerina to visit the mosaics of the Roman Villa of Casale, recognized a UNESCO Human Heritage site. Guided Tour of “Valle dei Templi”: admire the finest of all ancient Greek sites, with one of the most complete Doric Temples. Pamper yourself at your lovely country resort in Agrigento a few miles from the sea, located on a hill amongst olive groves where selected olive trees (some of them over hundred years old) produce a superb extra-virgin olive oil. Oil tasting and Dinner with local fresh products and wines at the estate. Visit a wine Estate in Marsala, one of the most famous wine regions in Sicily and learn about the origin, the story and uniqueness of Marsala wine. 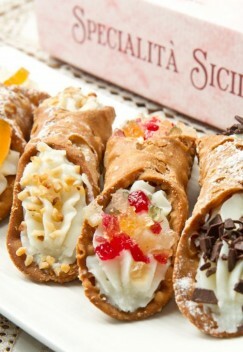 Delicious Lunch at the historical cellar, with typical Sicilian delicacies and wine tastings. Travel between Trapani and Marsala on the Salt Way Road where the ancient tradition of harvesting salt from the sea is still practised. Continue your western Sicily discovery to Erice, which was an important religious site associated with the goddess Venus, famous nowadays for marzipan candies and other delicacies like almond and pistachio pastries. Full Day dedicated to Palermo: explore the real heart of this amazing city, including the colorful and picturesque open air food market of “la vucciria” or “ballarò”. Admire the Duomo in Monreale, where the Arab-Norman art and architecture reached the pinnacle of its glory. Lunch and superlative wine tastings in a beautiful Estate south of Palermo: be amazed by the gorgeous landscape and top notch cellars managed by eight generations of wine makers. Taste the superlative quality of these wines and enjoy a delicious Lunch made with local grown fresh vegetables.